3. Jamal Hussein Ahmed, Secretary General. And 12 other Board members. The last General Assembly of the members (held every two years) was in June 2016. The earlier (2009) Report below is kept here for historical purposes. Somaliland lawyers association is non-political, non-profit making human right and legal professional association, which unite 90% of the Somaliland lawyers including law professors of Hargeisa University faculty of law, other law colleges, legal advisors of the both legislative Houses, Government ministries, local Governments, national commercial companies and legal consultancies of the UN and International Humanitarian agencies around Somaliland six regions and founded Jun 2004. SOLLA as a local professional association’s mandates are the enhancing the reputation of the Somaliland lawyers, to improve the quality of their performance in service delivery, and protection of the lawyers rights and observance for their duties; the realization of access justice, fair and independent judiciary, respect of human rights, promotion of the legal education, realization of democratic and proper application of the laws. Firstly the promotion of the respect for human rights is one of the indispensable purposes of the Bar (SOLLA). Secondly the system of periodic reporting within the context of the major international human rights instruments is the Associational vital element in monitoring the full and effective national implementation of international human rights standards. SOLLA works with the local societal groups and the government to the responsibilities and strategies towards civil protection on the observance of the human rights and fundamental freedoms of the community, fulfilment of democratic and sustain of peace in Somaliland. In addition, SOLLA engages a process to review the country’s existing laws and advise a process of the new legislation concerns the civil liberties and fundamental freedoms of the community, upgrading democratic system, access justice and fair and independent judiciary system of Somaliland. As an independent expert on human rights SOLLA has established human right monitoring system to eliminate abuses, violations or neglect, exploitation, discrimination, or exclusion from the development process and to provide free legal aid supporting for human right victims. It had a specific committee of experts nominated and elected within the association’s board. Hence our intermediate objectives is to adopt appropriate human rights and legal education strategy that could transfer human rights, democratic and responsibilities to the people we serve to enable them all realize, understand or claim and best defend and practice their rights. On the other hand, SOLLA carry out legal researches for promoting the understanding and legal knowledge of the country thought legal studies, analyzes of the laws of the country for their adoption, reforms and application and interpretation of the laws, to improve the legal system of the country. Accomplish capable and copentence legal professionals, effective and efficient practicable of laws, enjoyable justice, independent and impartial judiciary, realization of feasible human right protection, supremacy law, democracy, good governance and peace in Somaliland. SOLLA mission is ensure the improvement of the legal professional standard of the country, feasible access justice, laws enforcing and respect of human rights for social, civil, political, economical, dignity, security and equity that promote respect and fulfilment of their rights enshrined in the “Universal Declarations” and other subsequent International Bills of human rights. The long-term beliefs of the Bar are to promote and facilitate effective and efficient machinery of legal professionals and respect of their rights and responsibility and realization to practice of human rights respect and proper application of the laws; motivate and foster the effective judiciary system, administration of law and justice as well. Create mechanisms of civil society expansions through legal education programs, good advocacy and improving legal standard of the country that ensures citizens’ rights are respected and fulfilled. Monitoring: - SOLLA is bound to monitor the ethics of the profession, the fairness and independence of the judiciary, the effectiveness and quality of the lawyering skills respect, protection and fulfilment of human rights; and to help how others be held accountable for the meeting their human rights responsibilities. Systematic, organized human right conditions data reports and press works. And helping key state actors to bring violators to justice. Education: - We bound to improve the legal knowledge for the Somaliland legal professionals to enable them the defending and observance of human rights and fundamental freedoms of the community. Advocacy: - We bound to advocate directly for the respect, protection and fulfilment of human rights protection; access to justice, fair and independent of judiciary. Capacity Building: SOLLA is capacitating the legal professionals of the country, human right defenders, judiciary and law enforcement agencies to enable them to enforce respect, protection and defence of the human rights and fundamental freedoms of the community. Networking: Our networking strategy is to improve linkage and relationships between justice stakeholders, administrative systems and civil society. Enforcement: - The Bar association is bound to lobby and advocate the human rights enforcing and practice of the laws. Somaliland Lawyers Association has general assembly that all the members meets and held at once in every two years, the assembly is the supreme organ of authority in the Bar which approved the constitution of the Bar and has power the election of the BOD as per the constitution. Also the Association has effective governing “Board of Director” of Fifteen (15) members, which is functional. The Board of director is the leading body of the association between two sessions and they review and approves association plans, identify needs, and link planning to budget, approves implementations of the operational manuals, associational policies and procedures, internal control system, designs and develops the strategic plans/directions of the Bar; and amends where deem necessary. They prepare and announce, organize and hold the ordinary and extraordinary assembly meetings and they mobilize and secure the resources/funds of the Bar through broad donor-based fund diversification strategy. BOD nominate Executive Director of Bar and approve the departmental officers of the association; also the BOD has empowered to monitor and supervise the administration activities running by Executive Director. The Bar has written constitution approved by the Assembly on June 2004, and amended on July 2008. The association has registration legal documents, and therefore is operational by law. To create legal aid centre for the vulnerable groups of the community such as women, children, IDPs, Refugees, disabled, minorities and other disadvantages of the community. To translate in to the Somali language to the laws those written by foreign languages. To provide on job training by the recently graduated law students who are willing to be lawyers. To cooperate the legal training of the judiciary and law enforcement members. To establish an independent law journal. To upgrade the legal and human rights knowledge of the lawyers, through workshops, seminars, training, scholarships, fellowships and experience tours. To improve knowledge and responsiveness of the human rights by the community. To provide legal aid assistance for the vulnerable groups of the community such as women, children, IDPs, Refugees, disabled, minorities and other disadvantages of the community. To provide legal aid assistance to the poor remand prisoners, serious crimes accusers those can’t acquire lawyers fee, illegal detainees and those illegally held in custody at any cause. Advocate and lobby reviewing and reforming national laws and policies contrary to the International human right instruments. Advocate, lobby, initiate, assist to develop new laws and policies for human right protection. To cooperate, assist and advise law reforms and law drafting programmes. To collect and translate in to the Somali language the International human rights instruments and distribute them to the government organs, judiciary, civil society and community. To oversees, monitor and register the human right violations of the country. To conduct legal and human right studies and researches. To collaborate, take part, be come partner or give hand with local or international organization for the implementation of the projects related legal and human right sectors. To support the IDPs and refugees for the legal issues and make them aware to their rights. Lobby and advocate to pursue and correct the occurred human right abuses by the government. To realize institutional straightening, capacity building and provide working material and equipment to branches of the association. The Somaliland Women Lawyers Association (SWLA) is a non-profit making non-governmental organization. The founding members recognized the great need for creating a forum for women lawyers to offer each other mutual support and harness their professional skills into a force for educating society and particularly women in Somaliland society about their legal rights SWLA does this by advocating for legal and policy changes through enactment of laws and providing legal aid to women and children. • To provide a professional and social network for women lawyers. • Promote the wider participation of women in development. 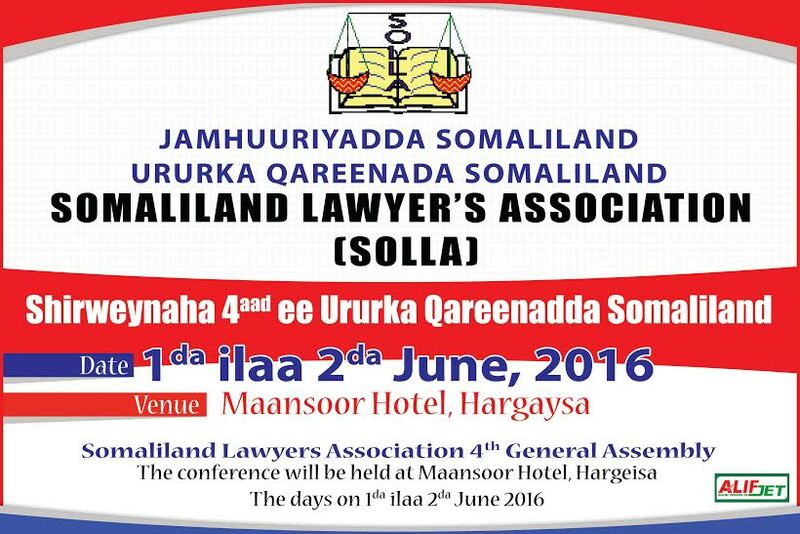 • Encourage greater participation of women lawyers in developing potential of their role within Somaliland. • Promote continuing education and legal awareness for women. • Advocate for the interests of women in the profession.